Two fossils this week in our series. The large segmented cone is a bisected nautiloid cephalopod from the Upper Ordovician of northern Kentucky. The original shell (made of the mineral aragonite) has been dissolved away, leaving the sediment that filled it (making an internal mold). Encrusting the nautiloid mold is a grayish, bumpy layer called Dermatostroma Parks, 1910. The nautiloid belongs to a subclass of cephalopods still with us today. This Ordovician fossil is in the Family Orthoceratidae McCoy, 1844, which existed from the Early Ordovician (490 million years ago) through the Triassic (230 million years ago). It had a straight, conical shell with walls inside separating chambers (camerae) and a central tube (the siphuncle) connecting them. They were swimming (nektic) predators that could control their buoyancy through a mix of gases and liquids in the camerae mediated by the siphuncle. 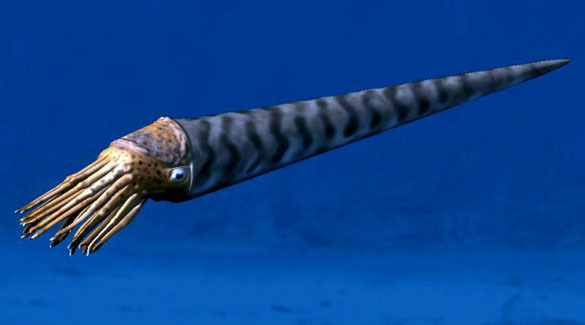 Reconstruction of an orthocerid nautiloid by Nobu Tamura. The fact that the mold is encrusted is interesting in itself. 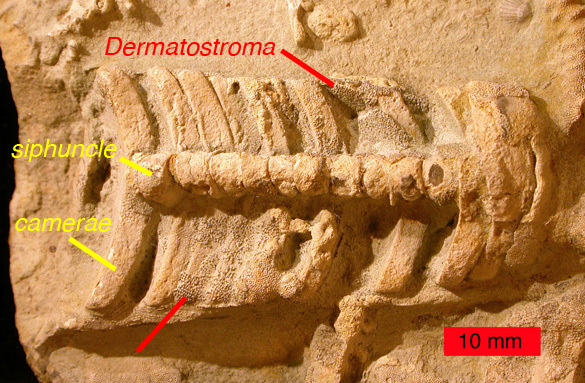 The encrusting organism (Dermatostroma) had to grow over the mold after the aragonitic shell had dissolved and the sediment cemented up. This must have happened on the seafloor, not long after the death and partial burial of the nautiloid. Such rapid dissolution and cementation is characteristic of Calcite Sea conditions, a situation we don’t have in today’s oceans. Dermatostroma is a genus of stromatoporoid sponge named and described by William Arthur Parks in 1910. It is always very thin and often distinguished by a field of tiny bumps (meaning this species is likely Dermatostroma papillatum). It was a filter-feeding organism, and its fossils are often overlooked. 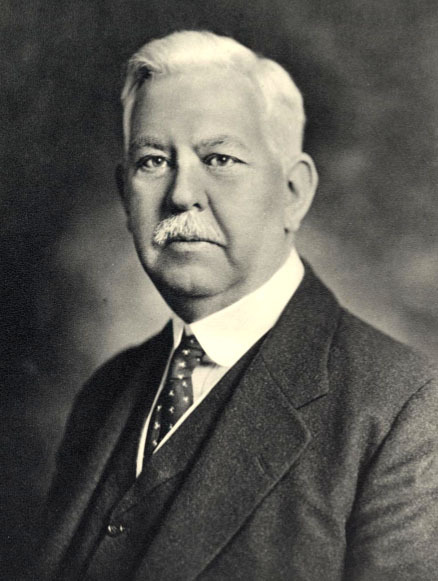 William Arthur Parks (1868-1936) was a Canadian paleontologist from Hamilton, Ontario. He was a professor at the University of Toronto for most of his career. In 1927, he was elected President of the Paleontological Society. Parks did detailed work on the almost microscopic details of fossil stromatoporoid sponges, and then made a dramatic field change and became an accomplished dinosaur paleontologist. The small ornithopod dinosaur Parksosaurus is named after him.